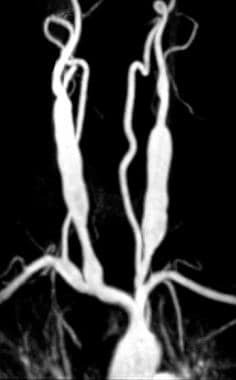 Symptomatic Takayasu arteritis involving both common carotid arteries in a 7-year-old child. Magnetic resonance angiogram (MRA) in the same patient as in image above, 18 years later, demonstrates mild dilatation of the venous graft. Carrel is credited as the pioneer of vascular surgery and for the use of cardiovascular tissue allografts; he is recognized for his work on vascular anastomoses. Initial results with his techniques were disappointing because of the high rate of degeneration and vascular failure due to poor preservation methods, immunologic rejection, and inflammatory reactions that produced fibrosis, calcification, and aneurysms. However, using his descriptions, major advances have been accomplished. In children, prolonged life expectancy must also be considered during fabrication of the ideal graft. Synthetic conduits are prone to infection, and, in small pediatric patients, grafts less than 6 mm in diameter have a high thrombosis rate, with poor long-term patency at 5 years (40-50%). Porcine small-intestinal submucosa has been used to construct vascular conduits. It is an acellular collagen matrix that is remodeled into host artery, with good resistance to infection. Bovine pericardium has been used to fabricate conduits for vascular reconstruction. It has a uniform thickness, is easy to handle and suture, has a low thrombogenicity, and grows adequately without causing unwarranted dilation. Sophisticated visualization systems and miniaturized multiarticulated instruments for robotic manipulation in small spaces have proved their usefulness by enabling procedures that were technically too demanding to perform in the past. These systems permit three-dimensional visualization, allow precise dissection, and are safe and effective. However, some authors still believe that these systems and instruments are too expensive and cumbersome. Additional research is needed to assess their true usefulness in this type of surgery. The vast majority of data regarding vascular reconstructive surgery in pediatric patients come from experience with right ventricular outflow obstruction, middle aortic (midaortic) syndrome (MAS), renal-artery occlusive disease and hypertension, iatrogenic vascular trauma, and access for hemodialysis. This article addresses the options and rationale behind choosing vascular reconstruction conduits in the pediatric population, as related to the most common circumstances requiring intervention. Several types of grafts can be used for vascular reconstruction. These can be divided into autologous tissue grafts, allografts, xenografts, alloplastic prostheses/artificial grafts, and tissue-engineered vascular grafts. Vascular grafts from autologous tissue are characteristically less thrombogenic, though they have been observed to have shorter durability and a higher rate of graft failure compared with artificial grafts. Autologous arterial and venous grafts, such as great saphenous and internal iliac veins, as well as internal mammary, radial, and hypogastric arteries, remain the criterion standard conduits for vascular reconstruction. Arteries might be more suitable for arterial reconstruction; however, these are not always available, and in particular, arteries suitable for grafts are not abundant. In addition, further examination is needed given the small number of arterial reconstructions reported. Bovine jugular veins have also been shown to be excellent immediate substitutes for right ventricular outflow tract reconstruction, [3, 4, 5] with early durability superior to that of pulmonary homografts. After a comparative study of 711 patients conducted from 1985 to 2012, Sandica et al concluded that the use of bovine jugular veins in patients younger than 25 years yielded better results than the use of cryopreserved homografts. Larger-diameter conduits seem to have improved performance as compared with smaller ones. Kim et al successfully used autologous veins to reconstruct the portal and superior mesenteric veins in adults after extensive resections for pancreatic cancer. If an injured vessel can be repaired primarily without excessive narrowing of its lumen, this would be ideal. When tension-free anastomosis is impossible, Kim et al used a spiral graft of the great saphenous vein, which is a good option for overcoming the size mismatch between the venous segments to be anastomosed. Rochon et al found recanalized umbilical veins to be an excellent, easy-to-harvest vascular conduit that can be used for multiple vascular procedures and repair. [8, 9] Umbilical veins are mechanically dilated ex vivo to be used as interposition grafts or as vein patches. Longer conduits and smaller veins (<3.5 mm) are technical risk factors for graft failure. In children, preserving the saphenous vein is advisable. Their small diameter is insufficient for large-vessel reconstruction. Currently, roughly 40% of children are overweight and may later experience a high incidence of cardiac disease, hypertension, and diabetes; thus, preserving these veins to keep them available later for coronary bypass in adulthood is recommended. No severe late complications (eg, venous stasis, ulcers, edema) are reported after vein harvesting from the lower extremities in children. The author has successfully used the contralateral internal iliac vein as an autologous graft to replace a segment of external iliac artery, resected en bloc with a pelvic tumor in a 10-year-old boy. The same vein (internal iliac) was also used to reconstruct the main trunk of the portal vein during an en bloc resection for hepatoblastoma in a 2-year-old boy. The author has also used contralateral saphenous veins to reconstruct arteries and veins during limb salvage procedures in which the vessels must be removed en bloc with the tumor in order to achieve clear resection margins. In such instances, bypass before tumor removal may be beneficial to decrease ischemic damage and reperfusion injury, since the vascular repair frequently must be delayed during the orthopedic reconstruction. The author has also used an autologous pericardium graft in a 4-year-old girl, to reconstruct a severely lacerated brachiocephalic vein during hemodialysis vascular access. In addition, the ipsilateral great saphenous vein can be divided distally and flipped over to be anastomosed to the external iliac vein while leaving its normal drainage to the femoral vein intact. Finally, taking advantage of the great angiogenic capability in children, with very efficient collateral circulation formation once an obstruction is developed, the author has resected the entire inferior vena cava in a 2-year-old child with a right-side Wilms tumor and a tumor thrombus extending into the retrohepatic vena cava that was technically impossible to detach from the endothelium via cavotomy. Chronic inferior vena cava obstruction created obvious collateral circulation into the suprarenal, diaphragmatic, and paravertebral plexus, for both kidneys. Expanded polytetrafluoroethylene (e-PTFE) graft placed between the brachiocephalic trunk and the right common carotid artery in an 8-year-old male patient with multiple endocrine neoplasia (MEN)-3 syndrome during a radical neck dissection for medullary thyroid carcinoma in which the artery was resected en block with the tumor. Cryopreserved cadaveric iliac arteries and veins have also been successfully used as conduits for vascular reconstruction. Research is being conducted using the umbilical artery or using venous homografts for small-diameter vascular reconstruction in newborn patients. In addition, minimally invasive harvesting techniques have been described. When the host veins are not useful or available for reconstruction, a synthetic or allogenic conduit is necessary. Prosthetic graft research began in 1952, when Voorhees and colleagues developed the first prosthetic graft using woven nylon. In the late 1950s, nylon, Orion, Ivalon, polyethylene terephthalate (Dacron), PTFE, and other polymers were tested as prosthetic grafts. In 1957, Creech et al concluded that Dacron and PTFE were physically stable, whereas nylon, Orion, and Ivalon were not. Since then, Dacron and PTFE have been adopted as the standard materials most commonly used in the manufacturing of synthetic grafts. PTFE grafts exhibit little inflammatory and thrombogenic reactivity, and PTFE continues to be the material of choice for small-diameter vascular grafts. PTFE is recognized by the body as an implanted foreign material. The blood-graft and tissue-graft interfaces create interactions that ultimately determine the patency of the implanted prosthetic graft. These interactions are complex but largely predictable. The typical reaction cascade starts at the blood-biomaterial interface with the absorption of plasma proteins, followed by deposition and activation of platelets, infiltration of neutrophils and monocytes, and migration and proliferation of endothelial and smooth muscle cells, followed by deposition of extracellular matrix. The implantation of a biomaterial into an immunocompetent host typically elicits an inflammatory response analogous to wound healing, involving several types of inflammatory cells. These cells synthesize and secrete cytokines that affect the cells in surrounding tissues, promoting cellular and capillary ingrowth. The ideal healing process of prosthetic grafts involves rapid endothelialization of inner surfaces and spatially and temporally limited subendothelial smooth muscle cell ingrowth, followed by phenotypic and functional differentiation of cell components and controlled remodeling of the extracellular matrix. Endothelial cells play an important role in the maintenance of graft patency. The presence of endothelium on the flow surface prevents platelet deposition and subsequent graft thrombosis; the presence of luminal endothelial cells also inhibits smooth muscle cell migration to the subintimal space, theoretically inhibiting neointimal hyperplasia. Optimizing these processes in order to obtain desirable results is a major concern of current research. e-PTFE is the most commonly used synthetic conduit because of its mechanical properties. It withstands pulsatile arterial pressures, given its good suture-retention strength, with compliance close to that of native artery. The material has increased porosity on the abluminal surface that allows for tissue ingrowth and has low porosity on the luminal surface to prevent graft leakage. In animals, the patency rate was 75%, even in grafts smaller than 4.5 mm. Furthermore, e-PTFE allows neovascularization response with transmural capillary ingrowth and has good resistance to infection. Indwelling central venous dialysis catheters are currently used extensively. Commercially available catheters are available in diameters from 7 French and larger, with adequate flow tolerance for the dialysis machine. However, problems such as kinking, infection, thrombosis, and vascular stenosis have plagued central venous dialysis catheter use in children. Children encounter the same issues as adults when arteriovenous access is being considered. The surgeon must consider the location, protection, maintenance, vascular immaturity, vascular size, and patient factors (eg, the potential inability of children to protect or care for their access sites). Creation of an arteriovenous fistula is the method of choice in children who weigh more than 30 kg; however, a vein of adequate caliber must be used. Fistulae are usually placed in radiocephalic or brachiocephalic positions. Interrupted sutures and magnification loupes are suggested during construction. In 1980, Applebaum et al reported satisfactory use of expanded polytetrafluoroethylene (e-PTFE) bridge fistulae in children. Such expanded e-PTFE grafts have been used in children who weigh as little as 3.8 kg, with long-term patency rates of 88%. In 1994, Lumsden et al reported a mean patency of 11 months with e-PTFE bridge grafts  ; however, grafts placed in children weighing less than 30 kg demonstrated poor function. In addition, they found that patency time was lower for femoral e-PTFE grafts than for upper-extremity grafts. This result was attributed to rapidly developing outflow stenosis, thrombosis, and graft infection. Dialysis access in children remains a persistent problem. Each conduit has limitations, which are usually related to durability. Arteriovenous fistulae are still considered the primary choice when feasible. Otherwise, an e-PTFE bridge graft in the upper extremity is a good alternative. PTFE grafts placed in the groin may also be considered. However, because of consistently poor patency rates, early use of PTFE grafts is discouraged in this region. When traditional methods are exhausted, nonconventional conduits (eg, free saphenous vein) have been used. Fibromuscular dysplasia (FMD) and middle aortic (midaortic) syndrome (MAS) are the most common causes of surgically remediable hypertension in young patients, and a considerable amount of research has focused on surgical intervention in this group. 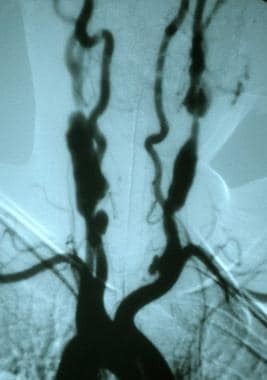 Takayasu arteritis (see images below) or temporal arteritis, neurofibromatosis, retroperitoneal fibrosis, mucopolysaccharidosis, and Williams syndrome are other etiologic factors. Developmental anomaly in the fusion and maturation of the paired embryonic dorsal aortas are mentioned as congenital causes of MAS. Patients with aortic obstruction, as observed with coarctation or MAS, typically present with severe hypertension, weak or absent femoral pulses, and abdominal bruit. MAS results from diffuse narrowing of the distal thoracic and abdominal aorta, commonly involving the visceral and renal arteries. Surgical treatment of patients with MAS requires an individualized approach. The proper procedure and conduit must be selected with future growth and durability in mind. The timing for reconstruction of the aorta, renal artery, and visceral arteries in children must be carefully considered in each patient. Timing for surgery depends on the severity of the hypertension and the patient's age. If possible, postponing surgery until the patient has completed growth is considered best. However, surgical intervention should not be delayed in patients with severe hypertension at high risk for end-organ damage. Regardless of the patient's age, surgical relief of the aortic constriction can be accomplished with patch angioplasty, bypass, or both. Patch aortoplasty with polyethylene terephthalate (Dacron) is recommended for young patients who are still growing. This allows for thoracoabdominal bypass at an older age when growth is completed. Dacron patches have a high success rate. Aortic cryopreserved homografts have also been used with success, but further research is needed to establish their usefulness and durability. If the patient cannot be medically controlled and surgery must be performed earlier, splenorenal or hepatorenal bypass (if the celiac axis is normal) is adequate. Otherwise, Panayiotopoulos et al advocated thoracoabdominal-to-infrarenal aortic bypass with reconstruction of the renal artery, with or without renal autotransplantation. They suggested these recommendations with the understanding that further surgery may be necessary as the patient outgrows the graft. On the other hand, when repair is performed, favorable results have been obtained with large-bore synthetic grafts with redundant length, anticipating subsequent growth. Percutaneous transluminal renal angioplasty (PTRA) has been described. It is technically feasible and usually provides worthwhile clinical improvement; however, experience in the pediatric population is still limited. Several options are available for aortorenal arterial bypass. Suggested bypass conduits include an autogenous hypogastric artery, saphenous vein, or prosthetic grafts. Patch angioplasty, splenorenal bypass, and renal autotransplantation have also been used. In general, prosthetic grafts for renal artery reconstruction have been associated with poor long-term outcomes. High intimal proliferative response leading to stenosis has been reported. In addition, prosthetic grafts do not grow and lead to recurrence of hypertension later in life. Prosthetic conduits also pose a lifelong risk of infection. As such, prosthetic conduits are not recommended as the first choice for reconstruction of the renal artery in young patients. Extensive data on surgical management of pediatric renovascular hypertension has come from the University of Michigan. In 1995, Stanley et al published their experience with 57 pediatric patients aged 10 months to 18 years. They strongly disagreed with the use of balloon dilation to manage renovascular occlusive disease with or without MAS and favored a one-stage surgical approach. Stanley et al evaluated several conduits for the aortorenal reconstructive procedures. Saphenous vein and hypogastric artery autografts resulted in the highest success rates. However, they noted significant dilatation of the vein grafts in the pediatric population, particularly those receiving aortorenal bypass grafts. They reported a 20% incidence of aneurysm formation when the vein was used for renal artery bypass or as replacement grafts in children. Hypogastric arterial conduits are relatively resistant to dilation and have demonstrated improved durability. For ostial lesions, they favor direct reimplantation of the renal artery into the aorta or a branch artery. In 1986, Messina et al also reported that arterial autografts are preferred in young patients who are still growing and have small vessels,  and they advocated prosthetic grafts for patients who have reached maturity. In 1978, Novick et al found that splenorenal bypasses had poor durability  ; they frequently became kinked and showed a high thrombotic rate. In addition, disease could progress in the celiac artery, leading to compromised flow and requiring further intervention. In-situ aortic or iliac-inflow renal autotransplantation are other options for managing renovascular hypertension. In-situ aortic reimplantation is useful in patients with short orificial stenoses. Autotransplantation into the iliac fossa may be useful after complex ex-vivo reconstruction of renal-branch lesions. Renal autotransplantation is also recommended in patients with MAS who are too small for definitive surgery but whose renal function is in serious jeopardy. Some authors believe that renal autotransplantation is probably the best method currently available for treating medically refractory renovascular hypertension, when anatomy and distribution of disease does not limit its application. Over the years, surgery for pediatric renovascular hypertension has changed as experience has revealed shortcomings with saphenous vein grafts, splenorenal bypass, and prosthetic conduits in young patients. The hypogastric artery has the greatest durability and has become the preferred conduit in pediatric renal artery bypass. Regardless of the conduit, comprehensive patient follow-up is essential. Various approaches have been suggested for recurrent aortic narrowing after a proximal aortic coarctation or interrupted aortic arch is repaired. Options include percutaneous balloon dilatation with or without stents, resection of the narrowed segment with direct anastomosis, patch aortoplasty with polyethylene terephthalate (Dacron), interposition tube grafts, or extra-anatomic grafts between the ascending and descending aorta. In 2000, Kanter et al studied extra-anatomic bypass in depth,  stressing that surgery is not the first option and that bypass should not be a first choice. They examined 19 pediatric patients (age range, 2 months to 18 years), of whom 15 had coarctation with hypoplastic arch, three had an interrupted arch, and one had diffuse aortic hypoplasia. They preferred resection of the affected area with primary anastomosis or patch aortoplasty but advocated extra-anatomic bypass in selected cases. Patients in whom traditional techniques are unlikely to succeed (eg, those with underdeveloped collateral vessels) and those who need concomitant cardiac repair may require bypass. The preferred technique for extra-anatomic bypass involves sternolaparotomy with extra-anatomic bypass from the ascending to the descending aorta by using a Dacron conduit.Other extra-anatomic bypass procedures performed using a multitude of incisions and repeated left thoracotomy have been reported to be successful. In some children, regardless of the incision, extra-anatomic Dacron or polytetrafluoroethylene (PTFE) bypass grafting to manage recurrent aortic obstruction is a feasible option in cases of complex aortic reconstruction. Aortic aneurysmal disease is exceedingly rare in children. 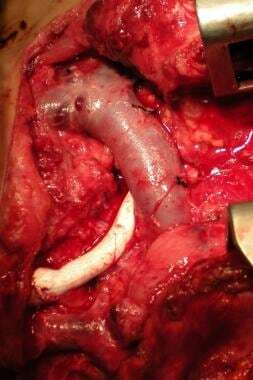 Thoracic and thoracoabdominal aneurysms have been encountered and treated with some success. In 1996, Hashimoto et al successfully reconstructed a thoracoabdominal aneurysm with a surplus polyethylene terephthalate (Dacron) graft. Surplus grafts are designed to eventually straighten with the growth of the child. In 1998, Clark et al repaired an abdominal aortic aneurysm and an injury to the left common femoral artery in an 11-year-old child with aneurysmorrhaphy and reversed saphenous vein interposition. During 25-year follow-up, normal caliber was demonstrated in the distal aorta and only slight dilatation was observed in the left femoral vein graft. Vascular injuries in infants and children are rare, are usually iatrogenic, and require a substantially different approach from that used to manage similar injuries in older children and adults. Many injuries, particularly injuries in infants, must be approached with the understanding that surgical intervention may not be fully successful because of the technical difficulties related to small vessels, as well as severe vascular spasm occurring in small children. In addition, peripheral vascular injuries that may result in limb loss in adults rarely do so in infants or children. Children have a particular propensity to rapidly develop collateral vessels, which often allows for limb preservation without surgical intervention. However, the development of an adequate collateral circulation for limb preservation is not necessarily sufficient to ensure normal patterns of limb growth. This quandary has created controversy surrounding the indications for surgical intervention. The timing of operation has also been a topic for debate. In 1976, Whitehouse et al evaluated fourchildren who underwent late operations and reported no improvement in leg-length discrepancy. In 1982, Klein et al reported three late operations with equalization of leg lengths after surgery. In 2001, Cardneau et al presented a series of 14 children with saphenous vein bypasses who underwent lower-extremity revascularization at a mean time of 5.7 years after the initial ischemic insult. Five children had limb-length discrepancy, which markedly improved after late revascularization. Although the timing of surgery remains controversial, most agree that surgical reconstruction is indicated in all but the youngest patients. Meagher et al conducted a 20-year retrospective evaluation of vascular trauma in 53 infants and children with blunt or penetrating vascular injuries. The most common sites of injury were the brachial and superficial femoral arteries and the inferior vena cava. The authors concluded that when surgical management is indicated, primary anastomosis with interrupted suture should be attempted. When this is not feasible and a graft is needed, they recommend using the internal iliac artery in small patients and the saphenous vein in larger children. Saphenous vein grafts provide good autologous tissue, usually adequately sized for most functions. However, they dilate under long-term arterial pressure. Polydioxanone suture use has been described in infants, facilitating growth. It may be used as a semicontinuous suture for anastomosis since it is a nonbraided monofilament, with tensile strength comparable to polypropylene, while still offering absorbability. In traumatic situations, these grafts offer a decreased risk of infection, but the graft should be followed by Doppler ultrasonography at regular intervals, with the anticipation that the graft will dilate, in which case it can be treated electively with a different option such as an arterial autograft. To accommodate growth, the vessel used should be spatulated to create an anastomotic lumen that is three times the diameter of the vessel in question, and the anastomosis should be performed with interrupted suture by using the principles of meticulous microvascular arterial reconstruction. Polyethylene terephthalate (Dacron) or expanded polytetrafluoroethylene (e-PTFE) conduits should be reserved to repair larger arteries in children whose arteries are similar in size to those of adults. In 2006, Lazarides et al reported 23 children aged 13 years or younger who had arterial extremity trauma. They concluded that school-aged children (>6 years) can safely undergo surgical repair, but neonates, infants, and preschool children are best treated nonoperatively if they have an ischemic but nonthreatened extremity. As long as a distal Doppler signal was present, limb loss was rare. Patients treated nonoperatively received systemic heparin, and limb-length discrepancy was noted in only one patient. They reported an 87% limb-salvage rate with this approach. Aortic injury usually necessitates resection of the injured or pseudoaneurysmal segment and reconstruction with a synthetic graft. The size of the child obviously presents a dilemma because the conduit does not grow with the child's aorta. Although in adults with critical limb ischemia, the great saphenous vein is superior to any other autologous vein graft in terms of patency and leg salvage rates, no single therapeutic strategy can be applied to all young patients with vascular injury. In a child of any age with a severely ischemic extremity, surgery remains the first choice. 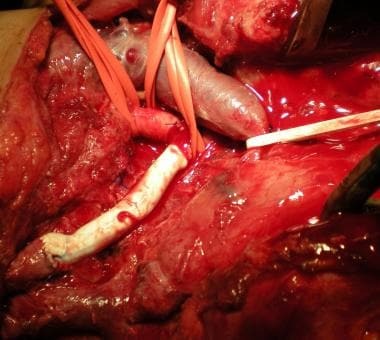 However, the surgeon must recognize that good outcomes may not be forthcoming in small patients or those who require complex reconstructions, unless the surgeon is experienced in using advanced microvascular surgical techniques. Arterial reconstructions in pediatric patients pose notable challenges to cardiac, vascular, oncologic, and pediatric surgeons. Small vessels, spasm, and the potential for growth over time should be considered. Moreover, the surgeon must be familiar with microvascular techniques, which require tremendous discipline and skill. The choice of conduit for vascular reconstruction in the pediatric patient depends on the patient's specific circumstance. No single therapeutic strategy can be applied to all children. The patient's age, developmental status, and indications for reconstruction dictate the choice of conduit to be used. Further clarification of the alternatives in young patients is still required. Research is underway on tissue-engineered conduits to decrease thrombogenicity and to investigate prosthetic material lined with endothelial cells or heparin. In the future, stem cells derived from bone marrow or embryonic stem cells might be used to regenerate vascular structures, probably over a synthetic absorbable conduit bed. The reconstruction of complex vascular structures by using computer-aided design may be used to fabricate custom-made, tissue-engineered replacement conduits in the future. Kurobe et al have been successful in placing tissue-engineered grafts in humans, using autologous bone marrow to seed a dissolvable prosthetic graft; however, these grafts have been used only for venous replacement in children. The technique of vascular tissue engineering, in combination with stem cell research, may hold the key for the creation of a practical and successful small-diameter prosthetic graft. Endoscopic techniques for harvesting saphenous vein grafts facilitate their use in lower-extremity limb salvage procedures. Vascular surgeons should become familiar with these techniques to minimize vein harvest wound complications and extend the options for limb salvage conduits. Meticulous hemostasis within the tunnel after endoscopic conduit harvest and avoidance of postoperative anticoagulation should help prevent postoperative hematoma formation and early graft occlusion. Widespread acceptance of minimally invasive intraluminal bypass surgery in pediatric patients will increase as flexible, small-diameter grafts and low-profile insertion systems become available. In adults, these designs have already markedly reduced perioperative morbidity, shortened hospital stays, and hastened recovery. In robotic surgery, future advances in reducing the size of instruments, improving image-guiding systems, and incorporating tactile feedback may expand the application of this technology to treat patients with cardiovascular disease. The amount of autologous tissue that can be harvested is often limited by the patient’s diminutive size. Inconveniently, with synthetic grafts there is often the need for life-long anticoagulation or antiplatelet therapy, which poses yet another disadvantage in the pediatric age group. Additionally, as the patients grow, they require multiple subsequent surgical procedures to upsize the graft. Thus, the importance of developing a versatile vascular graft with good patency; universal application; growth potential; and resistance to calcification, dilatation, and intimal hyperplasia cannot be over-emphasized. To address these challenges, tissue-engineering techniques have emerged to make biologically active blood vessels. The goal of vascular tissue engineering is to produce neovessels and neo-organ tissue from autologous cells using a biodegradable polymer as a scaffold. Bone marrow–derived mononuclear cells seeded onto tissue-engineered vascular grafts improve graft patency by decreasing the rate and degree of neointimal hyperplasia, which helps prevent stenosis. After implantation, there is a rapid loss of seeded cells, with less than 1% of seeded cells present at 1 week postoperatively, promoting cellular migration and ingrowth from circulating and adjacent cells. Liposomal clodronate, a compound that depletes macrophages, is used to prevent the inflammation-mediated processes by macrophage and mononuclear cells, which is crucial for neovessel formation and affects the development of stenosis. An ongoing US Food and Drug Administration–approved clinical trial at the Yale School of Medicine is investigating the mechanisms of tissue formation and evaluating the safety of tissue-engineered vascular graft use in children. The application of nanomedicine in tissue-engineered vascular grafts might aid in the design of second-generation grafts. Current goals include the identification of molecular compounds that could be added to the scaffold in order to mimic the inflammatory cascade provided by seeded mononuclear cells. The ability to either modulate macrophage infiltration or control smooth muscle cell proliferation/migration will help the formation of neointimal hyperplasia. The technique of phase separation allows the design of macropore structures, which can improve cell seeding efficiency and cell migration. Electrospinning involves a high-voltage power supply that allows modulation of nanofiber diameter, orientation, and density. Thromboresistant nanosurfaces have been manufactured using athrombogenic phospholipid polymers, which function by creating a biomimetic luminal layer. Given that stenosis remains a leading cause of vascular graft complications, the application of local controlled drug release to alter and drive graft remodeling holds particular promise for the design of next-generation grafts. Carrel A. Heterotransplantation of blood vessels preserved in cold storage. J Exp Med. 1907. 9:226-8. Oda T, Hoashi T, Kagisaki K, Shiraishi I, Yagihara T, Ichikawa H. Alternative to pulmonary allograft for reconstruction of right ventricular outflow tract in small patients undergoing the Ross procedure. Eur J Cardiothorac Surg. 2012 Aug. 42(2):226-32; discussion 232. [Medline]. Fiore AC, Brown JW, Turrentine MW, Ruzmetov M, Huynh D, Hanley S. A bovine jugular vein conduit: a ten-year bi-institutional experience. Ann Thorac Surg. 2011 Jul. 92(1):183-90; discussion 190-2. [Medline]. Prior N, Alphonso N, Arnold P, Peart I, Thorburn K, Venugopal P, et al. Bovine jugular vein valved conduit: up to 10 years follow-up. J Thorac Cardiovasc Surg. 2011 Apr. 141(4):983-7. [Medline]. Kido T, Hoashi T, Kagisaki K, Fujiyoshi T, Kitano M, Kurosaki K, et al. Early clinical outcomes of right ventricular outflow tract reconstruction with small caliber bovine jugular vein conduit (Contegra®) in small children. J Artif Organs. 2016 Dec. 19 (4):364-371. [Medline]. Sandica E, Boethig D, Blanz U, Goerg R, Haas NA, Laser KT, et al. Bovine Jugular Veins versus Homografts in the Pulmonary Position: An Analysis across Two Centers and 711 Patients-Conventional Comparisons and Time Status Graphs as a New Approach. Thorac Cardiovasc Surg. 2016 Jan. 64 (1):25-35. [Medline]. Kim SM, Min SK, Park D, Min SI, Jang JY, Kim SW, et al. Reconstruction of portal vein and superior mesenteric vein after extensive resection for pancreatic cancer. J Korean Surg Soc. 2013 Jun. 84(6):346-52. [Medline]. [Full Text]. Rochon C, Sheiner PA, Sharma J, Rodriguez-Davalos MI, Savino J, Facciuto ME. The utility of recanalized umbilical vein graft to the hepato-pancreato-biliary surgeon. Surg Innov. 2013 Apr. 20(2):126-33. [Medline]. Shinkai M, Mochizuki K, Kitagawa N, Take H, Usui H, Yamoto KN, et al. Usefulness of a recanalized umbilical vein for vascular reconstruction in pediatric hepatic surgery. Pediatr Surg Int. 2016 Jun. 32 (6):553-8. [Medline]. Arvela E, Venermo M, Söderström M, Albäck A, Lepäntalo M. Outcome of infrainguinal single-segment great saphenous vein bypass for critical limb ischemia is superior to alternative autologous vein bypass, especially in patients with high operative risk. Ann Vasc Surg. 2012 Apr. 26(3):396-403. [Medline]. Spahos T, Torella F. The basilic vein: an alternative conduit for complex iliofemoral reconstruction. Eur J Vasc Endovasc Surg. 2012 Apr. 43(4):457-9. [Medline]. Pascual G, Martinez S, Rodriguez M, et al. Patency and structural changes in cryopreserved arterial grafts used as vessel substitutes in the rat. J Surg Res. 2005 Apr. 124(2):297-304. [Medline]. Briones L, Diaz Moreno A, Sierre S, Lopez L, Lipsich J, Adragna M. Permanent vascular access survival in children on long-term chronic hemodialysis. Pediatr Nephrol. 2010 Sep. 25(9):1731-8. [Medline]. Applebaum H, Shashikumar VL, Somers LA, et al. Improved hemodialysis access in children. J Pediatr Surg. 1980 Dec. 15(6):764-9. [Medline]. Lumsden AB, MacDonald MJ, Allen RC, et al. Hemodialysis access in the pediatric patient population. Am J Surg. 1994 Aug. 168(2):197-201. [Medline]. Panayiotopoulos YP, Tyrrell MR, Koffman G, et al. Mid-aortic syndrome presenting in childhood. Br J Surg. 1996 Feb. 83(2):235-40. [Medline]. Stanley JC, Zelenock GB, Messina LM, et al. Pediatric renovascular hypertension: a thirty-year experience of operative treatment. J Vasc Surg. 1995 Feb. 21(2):212-26; discussion 226-7. [Medline]. Messina LM, Reilly LM, Goldstone J, et al. Middle aortic syndrome. Effectiveness and durability of complex arterial revascularization techniques. Ann Surg. 1986 Sep. 204(3):331-9. [Medline]. Novick AC, Straffon RA, Stewart BH, et al. Surgical treatment of renovascular hypertension in the pediatric patient. J Urol. 1978 Jun. 119(6):794-9. [Medline]. Kanter KR, Erez E, Williams WH, et al. Extra-anatomic aortic bypass via sternotomy for complex aortic arch stenosis in children. J Thorac Cardiovasc Surg. 2000 Nov. 120(5):885-90. [Medline]. Ye C, Yin H, Lin Y, Zhou L, Ye R, Li X, et al. Abdominal aorta aneurysms in children: single-center experience of six patients. Ann Thorac Surg. 2012 Jan. 93 (1):201-5. [Medline]. Hashimoto R, Hada M, Kamiya K, et al. Thoracoabdominal aortic aneurysm in an infant treated by thromboexclusion with thoracoabdominal aortic bypass. A case report. Angiology. 1996 Dec. 47(12):1157-62. [Medline]. Clark N, Brener BJ. Abdominal aortic aneurysm in a young child: a 25-year follow-up study. J Vasc Surg. 1998 Oct. 28(4):715-8. [Medline]. Flanigan DP, Keifer TJ, Schuler JJ, et al. Experience with latrogenic pediatric vascular injuries. Incidence, etiology, management, and results. Ann Surg. 1983 Oct. 198(4):430-42. [Medline]. Klein MD, Coran AG, Whitehouse WM Jr, et al. Management of iatrogenic arterial injuries in infants and children. J Pediatr Surg. 1982 Dec. 17(6):933-9. [Medline]. Smith C, Green RM. Pediatric vascular injuries. Surgery. 1981 Jul. 90(1):20-31. [Medline]. Whitehouse WM, Coran AG, Stanley JC, et al. Pediatric vascular trauma. Manifestations, management, and sequelae of extremity arterial injury in patients undergoing surgical treatment. Arch Surg. 1976 Nov. 111(11):1269-75. [Medline]. Cardneau JD, Henke PK, Upchurch GR Jr, et al. Efficacy and durability of autogenous saphenous vein conduits for lower extremity arterial reconstructions in preadolescent children. J Vasc Surg. 2001 Jul. 34(1):34-40. [Medline]. Meagher DP Jr, Defore WW, Mattox KL, et al. Vascular trauma in infants and children. J Trauma. 1979 Jul. 19(7):532-6. [Medline]. Lazarides MK, Georgiadis GS, Papas TT, et al. Operative and nonoperative management of children aged 13 years or younger with arterial trauma of the extremities. J Vasc Surg. 2006 Jan. 43(1):72-6; discussion 76. [Medline]. Kurobe H, Maxfield MW, Breuer CK, Shinoka T. Concise review: tissue-engineered vascular grafts for cardiac surgery: past, present, and future. Stem Cells Transl Med. 2012 Jul. 1(7):566-71. [Medline]. Dean EW, Udelsman B, Breuer CK. Current advances in the translation of vascular tissue engineering to the treatment of pediatric congenital heart disease. Yale J Biol Med. 2012 Jun. 85(2):229-38. [Medline]. Rathore A, Cleary M, Naito Y, Rocco K, Breuer C. Development of tissue engineered vascular grafts and application of nanomedicine. Wiley Interdiscip Rev Nanomed Nanobiotechnol. 2012 May-Jun. 4(3):257-72. [Medline].